This report discusses the rationale provided for the 7(a) program; the program’s borrower and lender eligibility standards and program requirements; and program statistics, including loan volume, loss rates, use of proceeds, borrower satisfaction, and borrower demographics. 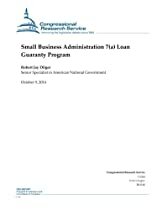 It also examines issues raised concerning the SBA’s administration of the 7(a) program, including the oversight of 7(a) lenders and the program’s lack of outcome-based performance measures.In addition, the report surveys congressional action taken during the 111th Congress to enhance small businesses’ access to capital, including the providing more than $1.1 billion to temporarily subsidize the 7(a) and 504/Certified Development Companies (CDC) loan guaranty programs’ fees and temporarily increase the 7(a) program’s maximum loan guaranty percentage to 90% (funding was exhausted on January 3, 2011); raising the 7(a) program’s gross loan limit from $2 million to $5 million; and establishing an alternative size standard for the 7(a) and 504/CDC loan programs.This report also examines legislation introduced during the 112th Congress to continue the fee waivers and increase the 7(a) program’s SBAExpress and recently discontinued Patriot Express programs’ maximum loan amounts. It discusses the Obama Administration’s decision to waive the up-front loan guaranty fee and ongoing servicing fee for 7(a) loans of $150,000 or less approved in FY2014 and FY2015; the up-front, one-time loan guaranty fee for all veteran loans under the SBAExpress program (up to $350,000) from January 1, 2014, through the end of FY2015 (called the Veterans Advantage Program); and 50% of the up-front loan guaranty fee on all non-SBAExpress 7(a) loans to veterans exceeding $150,000 in FY2015.